The MTG is a multi-tone signal generator where up to 16 CW signals are output simultaneously. These signals are internally combined so that the intermodulation products are controlled to be at very low levels. This output signal is primarily used to test the intermodulation performance of high power amplifiers (HPA). Each tone is generated by a synthesizer that has 10 Hz frequency resolution and can be set to any frequency within the frequency range of that module. 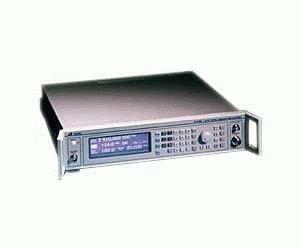 Any given MTG unit can be outfitted with up to 16 synthesizers. The typical configuration is either 8 or 16 tones. Both frequency range modules, Cellular and PCS, can be installed in a single MTG. The MTG represents a cost effective way to simulate the conditions presented by a base station to the output HPA.